Europe is under siege, flooded by wave after wave of migrants and refugees from destabilized nations. What drives this trend—and what awaits the continent if its borders collapse? In Goodbye,Europe? Hello, Chaos? Merkel's Migrant Bomb, former diplomat J. Michael Springmann provides an in-depth analysis of the migrant flood, its causes, and what it means for Europe. Building on arguments put forward in his previous work, Visas for Al Qaeda: CIA Handouts That Rocked the World, the ex–State Department official and attorney reveals how US foreign policy created the crisis. Springmann's insider knowledge of US policy permeates this insightful, sometimes terrifying look at a world where migrants become weapons, nationalism is condemned, and civil liberties hang in the balance. Thousands of American soldiers and civil servants have lost their lives in the War on Terror. Innocent citizens of many nations, including Americans killed on 9/11, have also paid the ultimate price. While the US government claims to stand against terror, this same government refuses to acknowledge its role in creating what has become a deadly international quagmire. Visas for al-Qaeda: CIA Handouts That Rocked the World sets the record straight by laying the blame on high-ranking US government officials. During the 1980s, the CIA recruited and trained Muslim operatives to fight the Soviet invasion of Afghanistan. Later, the CIA would move those operatives from Afghanistan to the Balkans, and then to Iraq, Libya, and Syria, traveling on illegal US visas. These US-backed and trained fighters would morph into an organization that is synonymous with jihadist terrorism: al-Qaeda. J. Michael Springmann served in the United States government as a diplomat with the State Department's Foreign Service, with postings in Germany, India, and Saudi Arabia. 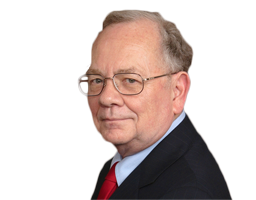 He left federal service and currently practices law in the Washington, DC, area. Goodbye Europe? Hello Chaos? I consider one of the very rare books that are so deeply and extensively researched and so widely and authentically sourced. It discusses frankly and uninhibitedly the worldwide wave of migrants, refugees and asylum seekers which flooded many European countries and threatened to break on our shores. The author unearthed the roots of the problems which caused that human deluge of millions. Mr. Springmann lays the blame on many factors including turmoil, political instability, unemployment, poverty, aspiring to better life and mainly violence and wars in Asian, North African and, in particular, Middle Eastern countries. He stresses that the major cause of the outflow of that flood is the United States' foreign policy which he claims is bent on using the migrant waves as a "mass destruction weapon." He reports many of the social, economic, cultural, demographical and political problems, legal and illegal, refugees created in each county especially nations of the European Union where serious crime rates has increased considerably. The author discusses in detail the problems each country faces separately then lumps all of them into one serious world crisis. He sharpens the focus narrowing the aperture on Germany, being the most important and populated European country, and uses it as an example of how the open-door policy for refugees and asylum seekers would tear the cultural and national fabric or a country by aliens whose presence threatens not only the unity of Germany but also the solidarity of the European Union. Thanks to my friend Greg who recommended that I read the book which, I in turn, recommend that every U.S. lawmaker, politician and even interested voters and laymen should read it. It is timely and comes in a propitious moment when the American debate on immigration, refugees and border protection is heating up. The book is a warning shot which directs attention to the migrant problems and as a reminder that solutions are urgently needed. The author offers some reasonable ones. If you want to really understand what's happening in the world today, "Goodbye Europe? Hello Chaos?" is a must read. Author J. Michael Springmann shows how mass migration is used as a weapon to destabilize nations. He explains how it has been done in the past, how it is currently being used in Europe and who is behind this weaponized migration, including some NGOs, billionaires, corporations and of course, intelligence agencies. Springmann shows how forced migration is a form of warfare used by the US to destabalize the Middle East and weaken Europe. The information in this book is well documented with 354 footnotes. I would also highly recommend his previous book "Visas for Al Queda". 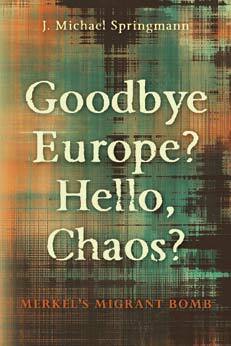 Michael Springmann’s book, “Goodbye Europe? Hello, Chaos? : Merkel’s Migrant Bomb” certainly presents a mind-jarring alternative perspective on Europe’s migrant crisis. It is hard to know which of a few notable characteristics of these migrants are most important. For example, (1) a very large percentage are young fighting-age Syrian men; (2) high-tech electronics (smartphones, etc.) and infrastructure for Internet connectivity are provided them by the likes of George Soros, Big Business, and, maybe, CIA front organizations; and (3) passports and visas from other-than-official channels. Not only are these migrations not what they appear to be, they are apparently a slow-moving form of warfare much more difficult to defend against than conventional military movements. Migrants have become instruments of war. I highly recommend this book for those wishing an insight into geopolitics in the twenty-first century that is radically different from the past. This is a fascinating book on the refugee crisis in Europe, and what is happening throughout Europe. I am so much enjoying reading this book by an author I trust and know is telling you the truth! His analysis and information is more than interesting, and please do buy this wonderful and so interesting book. I am 1/2 way through the book and can't put it down. Wonderful book, and this author also brought us Visas for Al Queda that was equally so interesting, and which I refer back again and again to the information! Thank you Mr. Springmann for your wonderful work on these books!! If you want to understand the "European Migrant Crisis" look no further than Goodbye Europe? Hello Chaos? It is required reading for everyone interested in current events. I fail to understand why the mainstream media do not tell these stories. Springmann also exposes the shadowy figures behind the scheme to destabilize the EU. It's time people took the blinders off their eyes and recognize what's happening. Invasions are invasions. History is full of this. We had better start paying attention for our own good. Read it NOW! Michael Springmann has done it again! I was both shocked and angered by what I read. He warns us that Constitutional Governments in Europe are being assaulted internally by unelected administrative bureaucrats from the EU administrative state and externally by an international plot to destabilize the European Continent's homogeneous culture through the forced migration of a hostile alien culture which can not be integrated. This book is required reading for all those who are concerned to learn why,who and how these weaponized refugees, whose own countries are being destroyed , are encouraged to leave on a difficult 2000 mile journey to countries in Europe who do not want to receive them, while their own neighbors will not take them. A former State Department foreign service officer's new book provides a shocking, timely, and credible circumstantial case that ties the U.S. training of Islamic radicals to our nation's major foreign policy disasters in the Mideast during the past quarter century. The book is Visas for Al Qaeda: CIA Handouts That Rocked the World — An Insider's View. Author J. Michael Springmann (shown at right) is the former chief of the visa section at the U.S. consulate in Jeddah in Saudi Arabia. He launched the book last week with his first lecture and book-signing, which admirers organized at the National Press Club in Washington, D.C.
Former U.S. consular officer in Jeddah, Saudi Arabia Mike Springmann could not have been more timely with his new book, Visas for Al Qaeda: CIA Handouts that Rocked the World. As demands grow for the Obama administration to release the 28 missing pages from the Senate Intelligence Committee's report on 9/11 intelligence failures, Springmann's book serves as a unique preface and epilogue to the Senate report. In fact, Springmann's description of the pipeline that provided U.S. visas to Saudi and other Wahhabist radicals provides for the reader what is, according to intelligence insiders, identified as a key finding in the "missing" 28 pages. The release of "Visas for Al Qaeda" also comes after the so-called "20th hijacker," Zacarias Moussaoui, has confirmed what many independent observers and researchers of 9/11 have already concluded: that the House of Saudi directly financed the attack and Al Qaeda. IF YOU DON’T WANT TO KNOW how sausages are made, don’t start reading Visas for Al Qaeda: CIA Handouts That Rocked the World by Michael Springmann. The sausages in this case: the string of too-easily-swallowed accounts of bloody events in the “global war on terror,” served up daily with relish by the mainstream media. In reality these sausages are filled with tainted meat that’s making everyone sick. Springmann is a brave whistle blower living in Washington, D.C. He’s written an accessible book, safe to digest, highlighting details of the corruption of the American Empire (and its accomplices, including Canada) as he experienced them from the inside during his years with the U.S. State Department. While he served as a visa officer in the U.S. consulate in Jeddah, Saudi Arabia, for instance, he was obliged under threat of dismissal to issue visas to persons hired clandestinely by the CIA to become trained-in-the-USA terrorists. Most of these psychopathic thugs were clearly and legally unqualified to be issued visas. There is every reason to believe the “Visas for Terrorists” program remains fully operative today. It takes a lot of expendable terrorists to run a global terrorism op. Springmann places his experiences both within the context of the historical roots of the U.S. Empire and within its current ongoing global destabilization project. And that only covers the bureaucratic aspect. Even more sobering is his sketch of human rights violations: torture, assassinations, massacres including bombings of markets, invasions and occupations of countries, destabilization of nations and regions. © Copyright 2014 Michael Springmann All Rights Reserved. Designed by iWebResults.